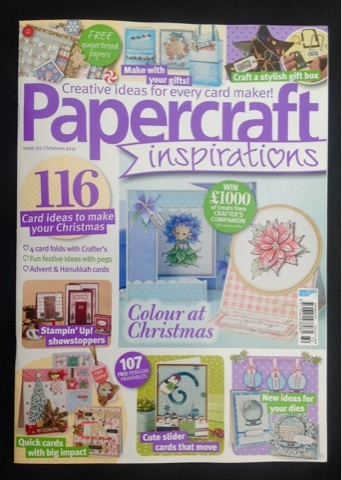 What a lovely surprise to receive my copy of Papercraft Inspirations in the post this morning, ahead of the release on sale in the shops on 2nd November. My article has covered two double-page spreads, plus a half page, and also featured snapshot photos on the front cover and one of the inside summary pages. 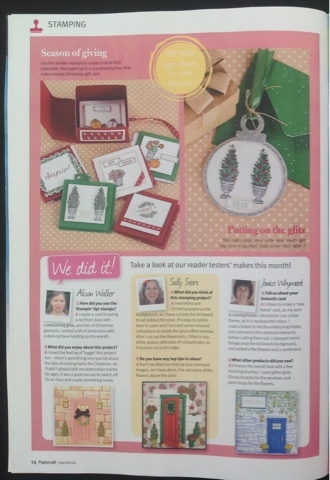 Some of the magazine designers then created similar projects using my Stampin' Up! products sent for the photos to be taken, together with their own 'craft stash'. I'm so pleased with the article and photos they have published around my submission. I will pop some up photos of projects over the next few days. 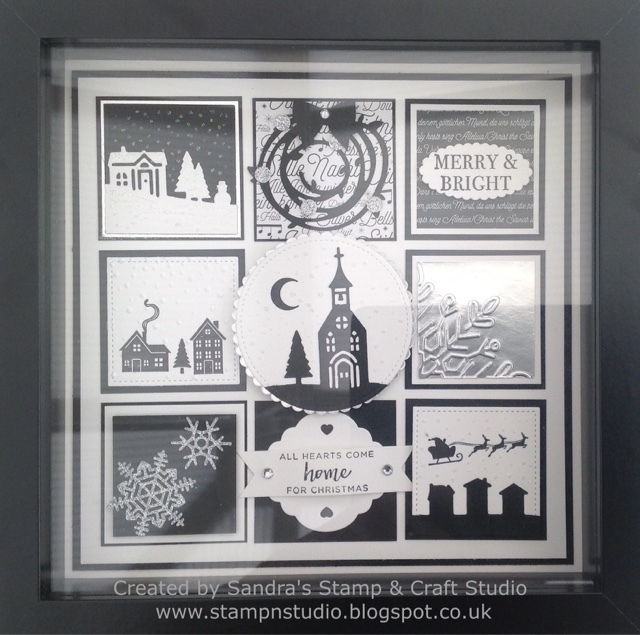 Having achieved my very first Stampin' Up! 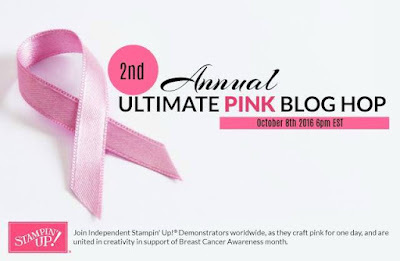 Incentive trip last month, I'm reliving that excitement all over again, taking part in the first Alaska Achievers Monthly Blog Hop with fellow Demonstrators, who have also earned the prestigious Stampin' Up! Incentive Trip, that only a limited number around the world achieve. 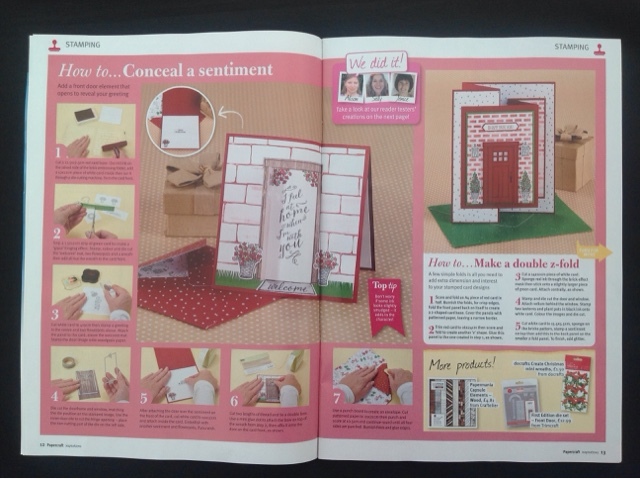 We will be hopping together once a month to show you ideas and designs using current Stampin' Up! products. I live in the UK and would love to help you if you have any questions. I look forward to regular crafting sessions with my Downline team, whether it be 1:2:1 sessions or collectively at team meetings. 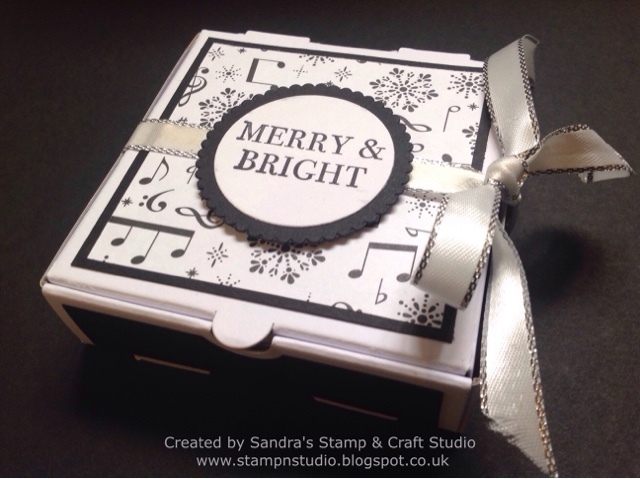 My team are encouraged to make samples using my products, especially in their early days, whilst still building their Stampin' Up! supplies. It's really nice when occasionally the roles are reversed and I can use a bundle that I do not have. 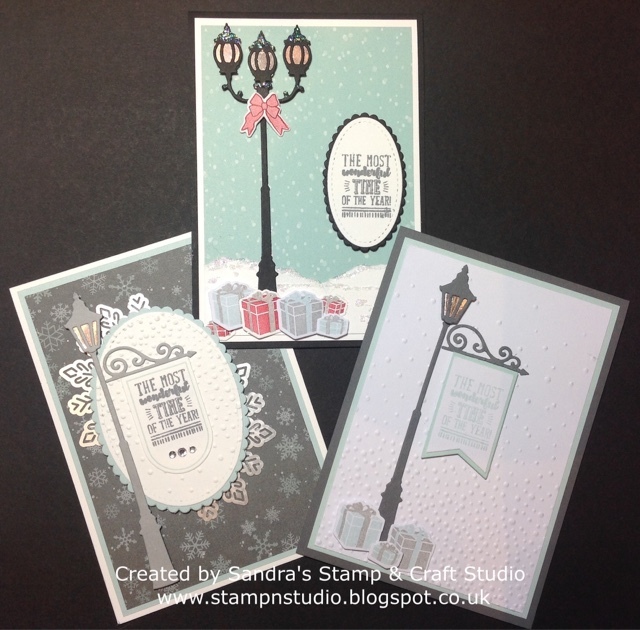 Today I'm sharing with you some projects Alison and I enjoyed creating with her new Brightly Lit bundle #146040, CAS-ing a few cards from online inspiration. This was our trio for the day, which I tried to keep to a colour theme, but also have the pieces prepared to complete one of these in Real Red, Garden Green and Soft Suede too, which I will post tomorrow. 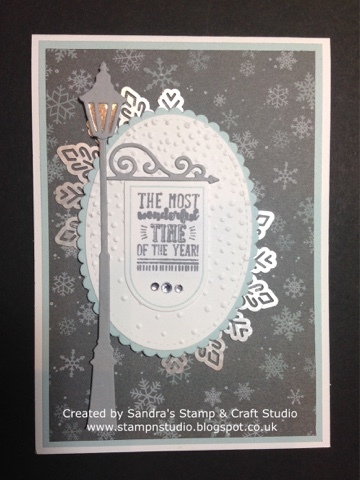 The Foil Snowflakes #144642 are proving to be popular and I like the way they can be cut for smaller elements. The presents are really sweet and might look fiddly, but the Photopolymer stamps make it quite easy to line up the ribbon on the parcel. 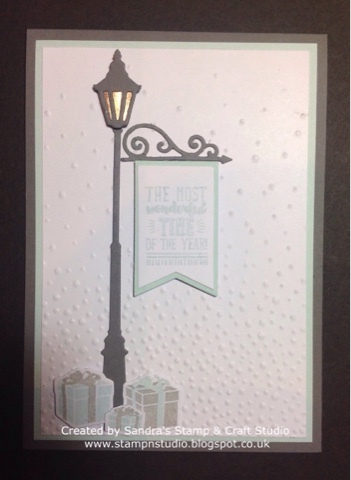 More presents on this card too but this time using the rounded lamps, with a circle of Champagne Foil Sheets #144748, torn snow banks, topped with Fine-Tip Glue Pen #138309 and sprinkled with Dazzling Diamonds Stampin' Glitter #133751. Thank you for joining us today - we are all so happy that you are taking part in our blog hop. Please grab a cuppa and continue 'hopping' round the globe, making sure that you don't miss anyone out as you will see lots of incredible inspiration along your tour. If you have time to add some comments too, they are always very welcome. Following a fabulous scrapbook weekend back in April, we immediately booked our October date before leaving on the Sunday afternoon. Sadly one lady had a close family bereavement so couldn't join us, but is eagerly awaiting the first one of 2018. Dates will be set as soon as we know Stampin' Up! Convention dates for 2018, hopefully in a couple of weeks. Please note the healthy fresh fruit bowl, amongst the Prosecco and wine glasses ! 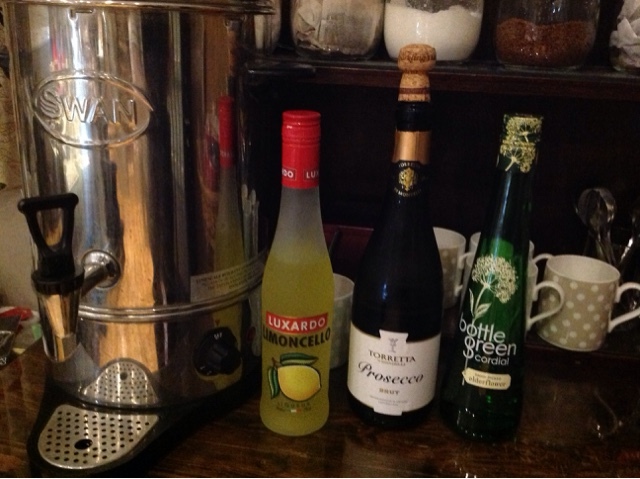 The 'urn' only managed one Cuppa before the space was taken over by a few bottles. Yes, it was 5 o'clock somewhere ! 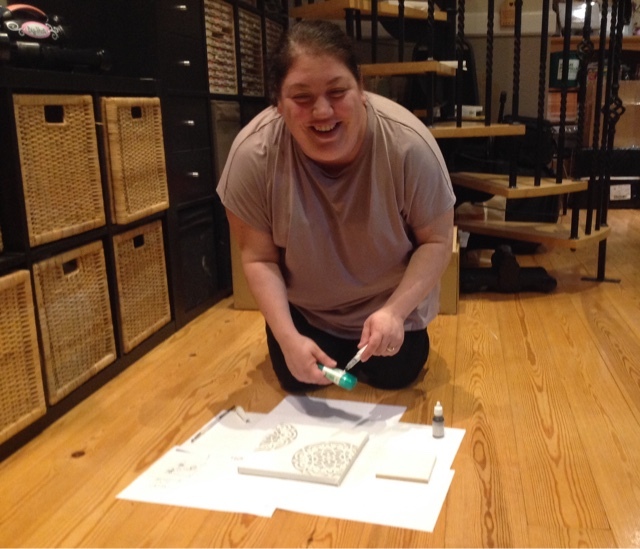 This weekend wasn't strictly just Scrapbooking, it was kind of an 'anything goes', with Jane competing the full Festive Retreat weekend projects and here Tanya was enjoying getting messy, creating her Mixed Media canvas. If you are interested in a whole weekend away, crafting in your PJs or comfy clothes and slippers, with a glass or two of your favourite tipple, then please get in touch with me. As accommodation and my Studio are on site, retreats are generally for small friendly groups of SIX crafters only. Places fill up quickly and I'm already looking to increase retreats for 2018, tailoring to suit different budgets, from 'bring your own projects' to fully tutored retreat projects, throughout the entire weekend. This year has also seen groups of crafty friends booking private events on mutually convenient days and I would love to discuss options, availability and prices with you. Please contact me and let's meet and discuss over a cuppa. Hope to welcome you here soon. Who isn't loving these cute little pizza boxes from Stampin' Up! ? Available in our 2017 Autumn/Winter catalogue in packs of 8, pre-scored and ready to assemble very quickly, they are perfect for all sorts of gift ideas. The food-safe interior make them ideal for gifting homemade cookies or confectionery, whilst adding a piece of coloured tissue could be perfect for a piece of jewellery. This project contains a set of SIX small notecards which can be used as gift tags, again using one of my favourite bundles, Hearts Come Home. I hope you like todays quick post and hope to see you back soon. I love these informal team sessions, getting together with some of my direct Downlines. 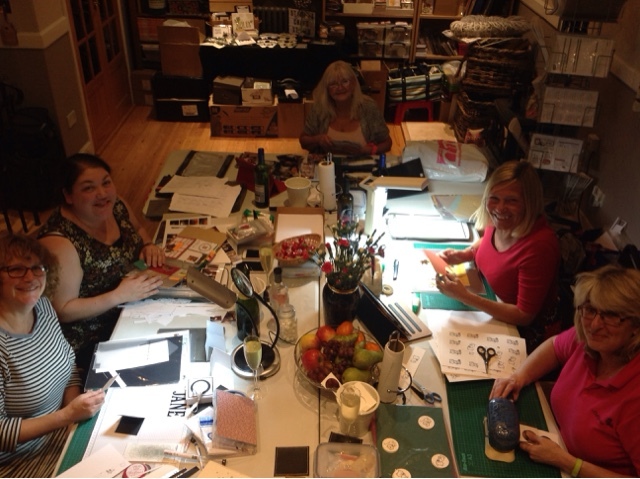 With three 'teamies' sleeping over last night, we crafted beyond midnight, working on individual projects, including swaps for Stampin' Up! On Stage Convention next month, and then finished with a joint project, inspired by video from fellow Demonstrator, Monica Gale, using Brightly Lit Christmas bundle. Our design varied slightly because we didn't have the co-ordinating stamp set to hand, but still worked beautifully using the die-cuts. Luckily, I had 4 wreaths stamped from earlier in the week, crafting with another of my Downline team, which we shared, in order to compete our samples. 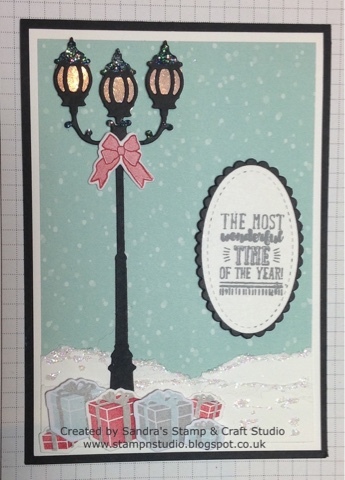 I hope you love this Brightly Lit stamp and Die bundle as much as we did ! A really warm festive welcome to you today. You join us today for another small Blog Hop round a few local team members. Our theme for today was 'Deck The Halls', anything to decorate our homes for the festive season. 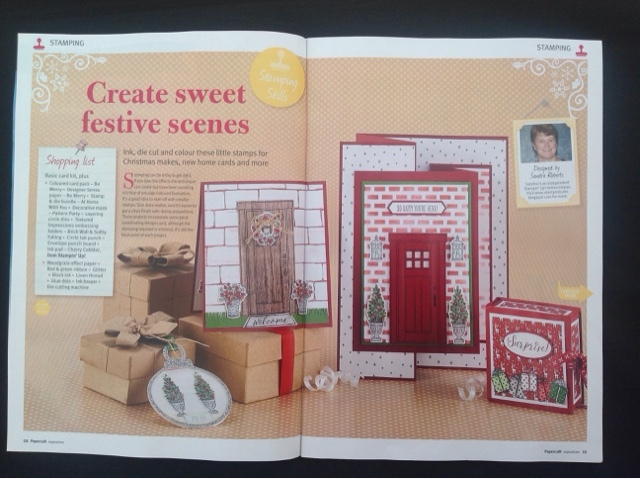 Depending on where you joined us, you may have joined me from Barbara's blog HERE and her gorgeous festive projects. Today I'm sharing with you one of my recent Retreat projects, using the 'Hearts Come Home' bundle which attendees received in their goodie bag. 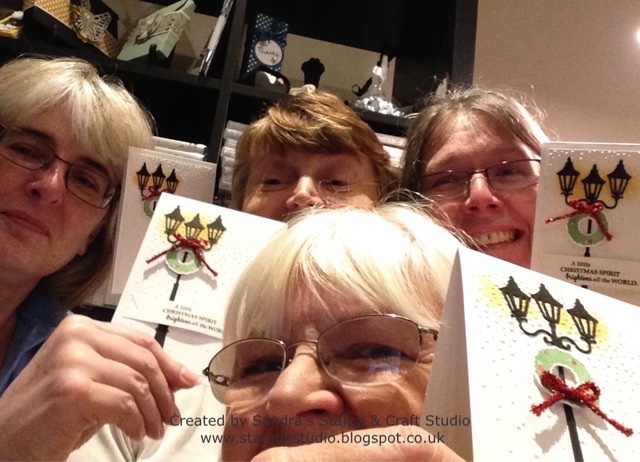 Today I had another 7 ladies creating the same project, plus a few co-ordinating cards. This is mounted in frame but has reflection on glass. 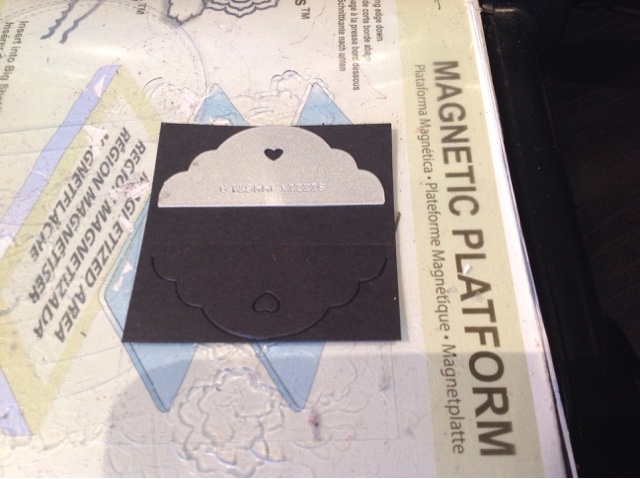 Here is the blank before mounting, to give a clearer photo. 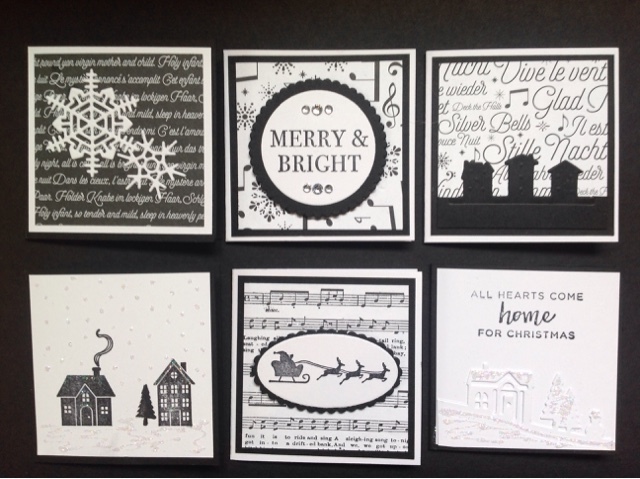 To continue along your hop and carry on your tour, click Tanya's Blog HERE to see the wonderful projects she has to share with you. Today is my very first 'Global' Blog Hop, taking part in this 2nd Annual Ultimate PINK Blog Hop, with fellow Independent Stampin' Up! Demonstrators around the Globe, hosted by RemARKablycreated.com. These days, most of us can relate to a friend, acquaintance or loved one who has, or is, suffering from the dread 'C' word, so I naturally turned to Stampin' Up! 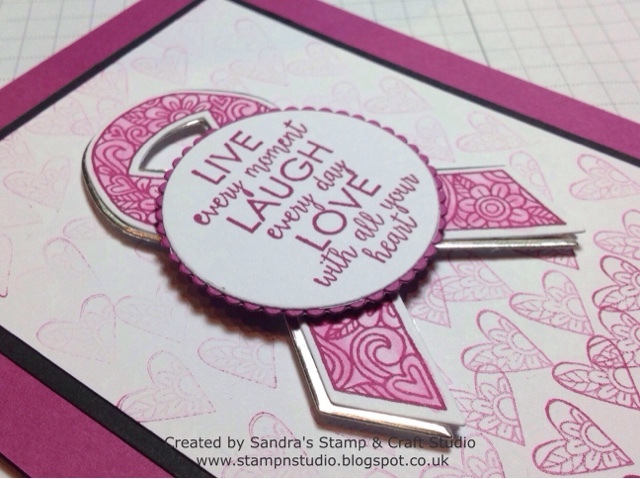 Ribbon of Courage Stamp & Die bundle, inspired by Million Sales Achiever Patty Bennett, for todays project. Purchasing the Stamp and Die bundle together, you can save 10% using #145341 Wood mount or #145342 Clear mount. Here I have used one of our gorgeous 2017-19 In-Colours, Berry Burst. 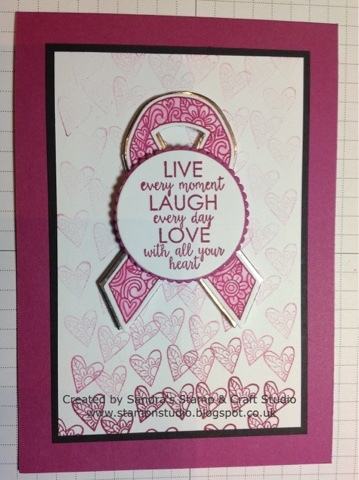 The Ribbon of Courage image has been stamped in Berry Burst ink and coloured in using an Aqua Painter. The Ribbon motif, was cut twice in the gorgeous Champagne Foil Sheets #144748 from the 2017 Autumn/Winter catalogue, wrapping either side of the front image, leaving a narrow foil border. In real life, these have kind of a lovely rose gold finish. 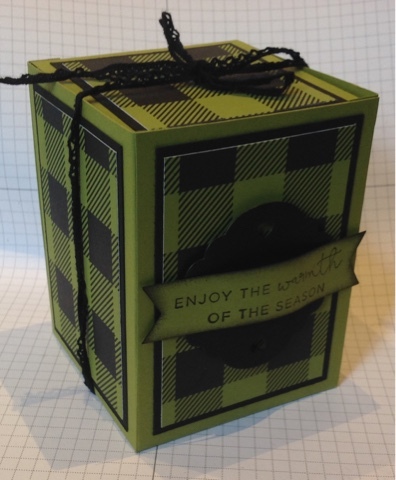 Both the Ribbon and sentiment have been raised on 3D Stampin' Dimensionals for added depth. The small heart punch was stamped at the bottom of the front panel, continually stamped rising upwards to the top, with ink getting paler with each stamp. I hope you have enjoyed my project today and enjoy continuing your 'hop' around the Globe. Follow links here to enjoy over 50 fellow Demonstrators in this PINK hop. Today I'd like to share with you, a very simple way to make a £1 Terry's Chocolate into a more attractive gift. This box has been created perfectly to fit a Terry's chocolate orange inside, with complete box construction using just one 12" piece of card. 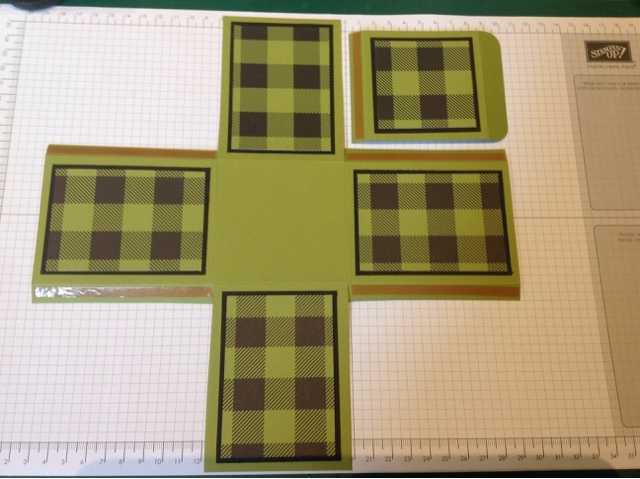 Simply add mat layers and Designer Series Papers of your choice. Remember, these can make great little gifts at any time of the year, so why not make a few to store flat but ready decorated, for quick assembly when you need an unexpected gift. This lovely Die is part of the Hearts Come Home stamp and Die bundle. I think it was intended to be the top of tags, with the cute little heart being where your string or thread goes. Crafters often find alternative ways to use, so here, I've used it top and bottom of a small square of card, adding a curved banner through the centre for sentiment.